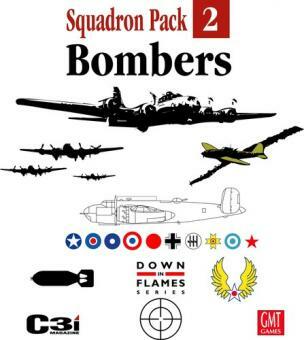 Following on the heels of the first Squadron Pack for the Down in Flames series of WWII air combat card games comes Squadron Pack 2: Bombers. While the first pack contained new fighters, this one adds more Light Bombers and Formation aircraft to the system. The pack will include such famous aircraft as the B-25H (complete with 75mm gun) and the Il-2m3 Sturmovik. But there will be lesser-known planes as well, like the German Hs-129B-1/R2 (a sort of WWII version of today's A-10) and the Italian CANT Z.501 Gabbiano flying boat. One of the difficulties in creating a pack of bombers and patrol planes is that up until now these aircraft types have only been used in the context of a Down in Flames campaign. The rules included in the pack provide three ways around this problem. First, there are guidelines for adding Formation aircraft to basic game dogfights. Second, the pack includes a number of stand-alone generic missions into which players can simply "plug in" appropriate aircraft. Finally, we have included rules (courtesy of Roger Horky) that allow Formation aircraft to engage in a form of dogfighting (called Gunnery Duels in the game) with other Formation planes. So if you've ever wanted to fly a Short Stirling against an FW-200 Condor, now's your chance. Squadron Pack 2's rules also contain reprints of some of the rules from Corsairs and Hellcats for the benefit of those players who don't own that game (you know who you are). In addition, there are rules for two new ground attack weapons: the German Hs 293 radio-controlled air to surface missile and Fritz X radio-controlled glide bomb. 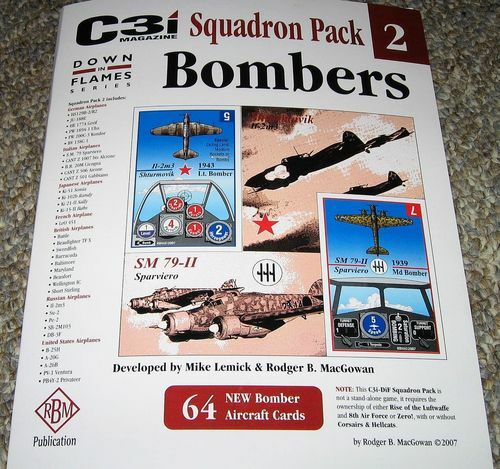 Like the first pack, Squadron Pack 2: Bombers will contain 64 new aircraft cards printed 8 to a sheet in the same enhanced graphic style as Squadron Pack 1. The pack will also include a short (4-8 page) rulebook and an 11x17 wrap around cover decorated with Rodger MacGowan's gorgeous artwork. The inside of the cover sheet will form a play mat for use during Gunnery Duels.